At RVA City Painters, our Ashland painting contractors have over 30 years of experience providing the local community with the highest quality property beautification services. We are here to assist you with both interior and exterior painting projects, wood staining, pressure washing, and more. In all of our services, we will work our hardest to achieve your complete and total satisfaction. Call RVA City Painters today if you need to hire a professional painting contractor in Ashland. Our polite and knowledgeable staff can answer any questions that you may have. Together, we can achieve all of your unique goals. We would be excited to schedule your appointment today. Keeping your commercial property well painted is absolutely essential to the profitability of your business. At RVA City Painters, our Ashland commercial painting contractors seek to develop long lasting and mutually beneficial relationships with all of our business clients. Through the high quality services that we provide, we seek to convey the fact that you can trust us with all your present and future painting needs. Our highly skilled experts can keep your commercial property looking professional and inviting to potential clients and customers. The interior living spaces of your home have an immense impact on how you and your family enjoy your property. If you want to vastly improve each and every room of your residence, you should contact our professional painting contractors for assistance. 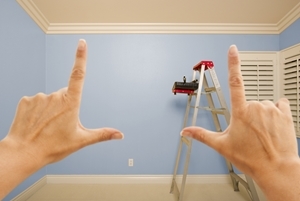 Our house painters in Ashland, VA can help you update every area of your property. If you have a unique vision of what you want your interior living spaces to look like, we can make that vision become a reality. We will work our hardest to provide you with the best and most customized results possible for interior painting in Ashland. As a Ashland property owner, you have an obligation to keep your home or business looking its absolute best. Inherent in this responsibility is keeping the exterior of your property as clean as possible. Without the proper skill and equipment, this can be an extremely onerous obligation. At RVA City Painters, our Ashland pressure washing contractors are here to help. We are highly skilled at all types of power washing services. This is the optimal way to blast away years of dirt, grime, stains, and rust from all different types of surfaces including asphalt, concrete, wood, siding, masonry, and more. Our power washing contractors will customize our efforts to your unique needs. In this way, we can provide you with the best results while preserving and protecting your property. If you are looking for a dependable Ashland painting contractor then please call 804-557-4898 or complete our online request form.